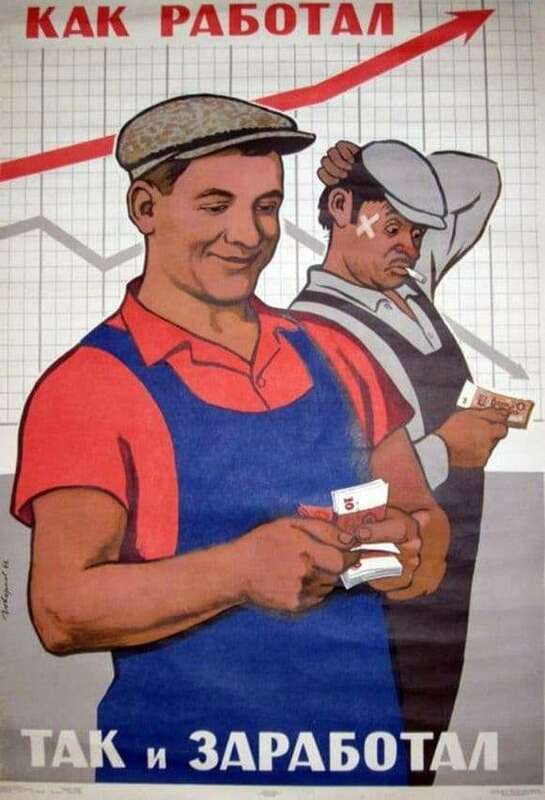 Poster from the series, calling on the Soviet people to work, a healthy lifestyle, honesty. Such propaganda posters could be seen several decades ago throughout the territory of our country. Somewhere in the old buildings they still hang, warming the soul with memories of the years lived in the USSR. In recent years, the fashion for retro-things has appeared, which until recently were not at all retro, but a familiar phenomenon for everyone. Among such things, of course, are posters campaigning for the population in the USSR. The poster “How it worked, and earned it” is a vivid example that parasitism was never encouraged or rewarded. We see how a proud, strong male laborer gets his money for the work done, and after him, it is precisely the parasite who does not do anything, and, apparently, counted on the same payment. This is a strong motivational poster for all who want to start lazing. After all, no one wanted to be like the character from behind. Therefore, in Soviet times, production was at a high level, the country went forward in long strides. And how could it have been otherwise, when every day you saw such posters on various important topics. Men wanted to be like the characters from these pictures. After all, the artists portrayed a conscientious person to be strong, strong, athletic, leading a healthy lifestyle and working for the benefit of the Motherland and family. Fought such posters and drunkenness. On them, the artists did not stint on the plots in order to motivate the Russian people as much as possible. Of course, such agitation gave a powerful impetus to action. Soviet posters conveyed to the person loud slogans that remained in people’s memory for the rest of their lives. It was a time when the working man was called to sport, to the proper organization of labor, to vigilance, to achieve the maximum, to culture of behavior and adherence to safety measures.